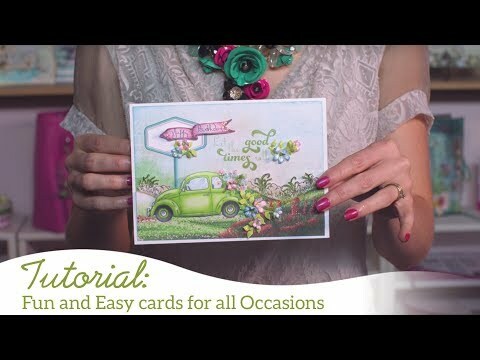 For more tips on creating with the Young at Heart collection, watch the tutorial at https://youtu.be/kmqAVM6ibfM. Instructions: Cut 2 pieces of 5 1/2 x 8" cream cardstock and score them on 1 short side at 1/2", now glue these on the score line on top of each other. Cut a nice image of the paper collection for the cover of your card, the size is a 1/4" size smaller than your card, I used the paper with a palm tree and the car. I put some Crystal Lacquer on the windows so that they shine, allow to dry. Cut the corners with a corner punch, ink all the edges with Vintage Photo ink. Stamp flowers and leaves in black ink onto cream cardstock and die cut with coordinating dies. Color with Zig markers and shape lightly using the deluxe flower haping kit, and trim flowers from stems. Adhere onto the back of truck. Using a pearl pen put dots into each flower, along greenery and on the palm tree. For the inside top part cut out a piece of decorative paper 1/4" smaller than the card and cut the edges with a corner punch. Ink all the edges and glue the paper down, cut a piece of cream cardstock at 9 1/2 x 3 1/2" and fold that in half, cut a half circle out of the front top, then glue the sides down so that you have a pocket, now make an harmonica card by cutting a piece of cardstock of 10 1/2 x 4 1/4" and score at 1" (pocket) 4", 7", 10" then you have a piece of 1" for a pocket and a piece of 1/2" for a tab. Glue this tab under the left side of the pocket. Now glue the ribbon on the back of the pocket, glue the pocket on the top part of the card, close to the fold line. Make a tag for the inside 2 3/4" x 6" and cut off the top edges and put an image on it from the collection, make a hole in it and put a piece of twine through the hole. I cut out the camera from the silhouette store (https://www.silhouettedesignstore.com/view-shape/75317) and in the hole I put a brad, only put glue on the left and bottom part and glue this on top of the pocket. Decorate the harmonica fold with some of the images of the collection or you can put some photos on it too! Tie the ribbon into a bow on top of the harmonica. For the bottom part of the card cut out a piece of decorative paper from the collection 1/4" smaller than the card, cut the corners, ink the edges. Now you take a piece of cream cardstock of 3 x 7". Take the Ornate Border die and die cut the edge as shown. Trim the strip to make a nice edge (using scissors or paper trimmer). Fold the ends of the strip to the back of the pattern paper and now you can adhere the whole thing down, creating a pocket. On the bottom of your card cut a strip of paper 5 1/4x 1 1/2" and glue this on top of the pocket. Now you can make some tags of your choice for in the pocket. I cut the tags and matted everything on cream cardstock.